Wildflowers of the Winter Solstice . . . The 2011 Winter Solstice arrived like a lamb, to put it mildly. Manhattan enjoyed one of those calm, cool, balmy days that cultivate the impression of an indeterminate time of year; a kind of day that almost shouts for one to take the opportunity – the gift – to enjoy the outdoors before the traditional weather sets in, or roars in, for the season. I listened to that call. Outside and above, the sky resembled a portrait painting of multiple cloud types, including cirrus and cumulus, floating by at different levels of altitude, passing by at different rates of speed, forming a variety of picturesque motion patterns that took the sun in an exceptionally sparkling way during this shortest daytime of the calendar year. Back on the surface, a short walk around the West Village revealed nature was still in an active phase. Gulls, mallard ducks, cormorants, brants, and Canada geese mingled along the Hudson River where several anglers squeezed in one last session of casting for striped bass. Back on city land, many of the common wildflower species remained unfazed by last week’s first frost of the season. 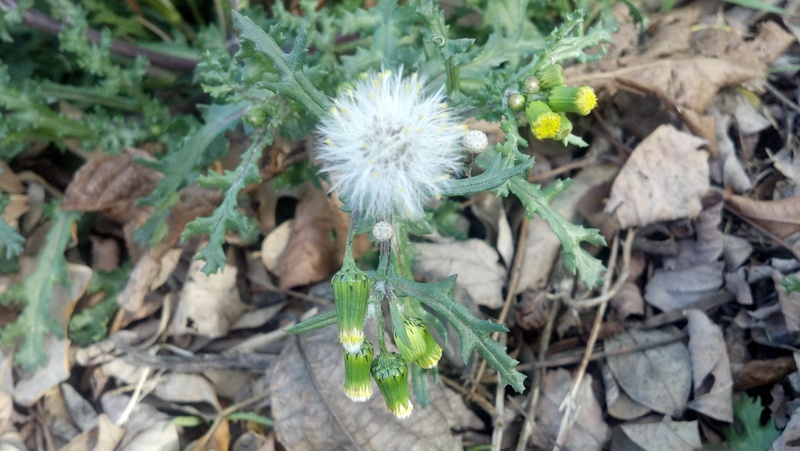 The basal rosettes of Sow Thistle, Dandelion, and Common Plantain were fresh and green, not deflated and gray as they were by this time last year. 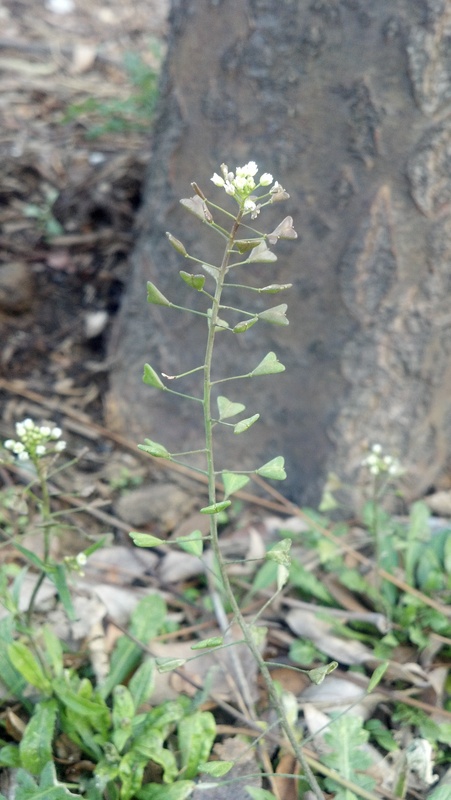 White Snakeroot, Common Chickweed, and Shepherd’s Purse remained in bloom in several sheltered spots. None of these plants could match the vigor and numbers of the winter annual Groundsel, Senecio vulgaris, a diminutive member of the Asteracaeae family. 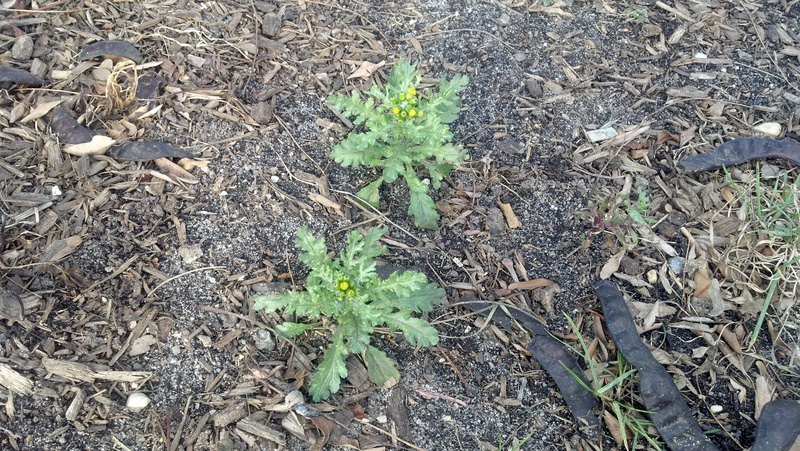 Just as the Dandelion will carpet lawns in spring, the Groundsel can proliferate in late fall. Find it thriving around the bases of trees and within the thinned out spaces of bare shrubs. Individual plants resemble a tiny evergreen bush and look so self contained as to appear planted by a gardener. The yellow inflorescences of this cosmopolitan ruderal never seem to open into full golden blooms like its springtime cousin, but it does go to seed in distinctive white balls that in combination with its sharply-lobed leaves look rather festive in light of the season.